“A program is trying to perform an action that may result in an e-mail message being sent on your behalf” have been nagging us for quite a while, so here’s how to stop them! Everyone who uses Outlook add-ins has to cope with “a program is trying to […]” windows since Outlook 2000 SP2 – that’s when Microsoft decided to implement them. This security measure is unfortunately mandatory, but what I don’t quite get is why the option to completely disable it isn’t present. I have been using Outlook since ’98 and I can’t remember the last time my PC was infected with a virus, so why must I give a specific add-in permission (just for a limited time, mind!) to do its thing? I’m sure that it’s not just me who, in the morning, saw that an important email wasn’t delivered because Outlook chose to be extra-super-safe with a message and kept telling me that “a program” is trying to do stuff in the background. 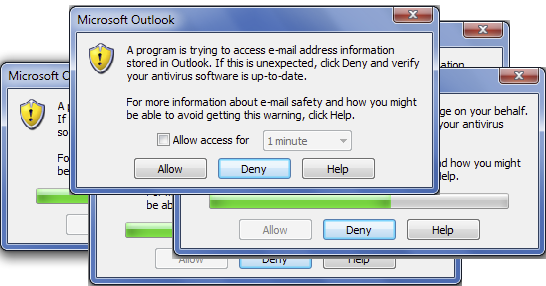 Even more annoying are the 5 seconds all users of Outlook 2000 SP2, Outlook 2003, 2007 or 2010 have to wait until clicking on Allow when the “a program is trying to…” window pops-up and the fact that “a program” doesn’t really tell us much about which program exactly is trying to do what. 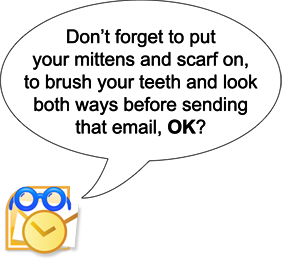 Each implementation of Outlook brought little “tweaks” to the algorithm so now these warnings are rarer, but if you want to get rid of them completely you can just install our award-winning add-in, Bells&Whistles for Outlook. In addition to over 40 features that will surely energize your work day, Bells&Whistles for Outlook comes with the option to auto-confirm those pesky “a program is trying to …” messages. A lifetime license costs only $29.95 (30 days money-back guarantee) and you can buy it from here, or you can just try it out by downloading the trial version here. The only thing you have to do is check that box and no more “a program is trying to …” nags! Why are those “a program is trying to …” pop-ups present? Are there any free alternatives that disable the “a program is trying to” pop-ups? There are a few programs that disable the “a program is trying to …” warnings, just do a Google search and you’ll come across their names and respective sites. Even so, I advise you to read their requirements and info since some only support old versions of Outlook while others aren’t actively maintained anymore. Of course, there’s always Bells&Whistles for Outlook, which in addition to creating complex and productivity-friendly profiles will also auto-confirm the “a program is trying to …” warnings in the background (no 5-second wait!) so your emails will leave instantly! Just install the 30-day full-featured trial version, speed-up your email routine and also say goodbye to the annoying “a program is trying to …” screens!